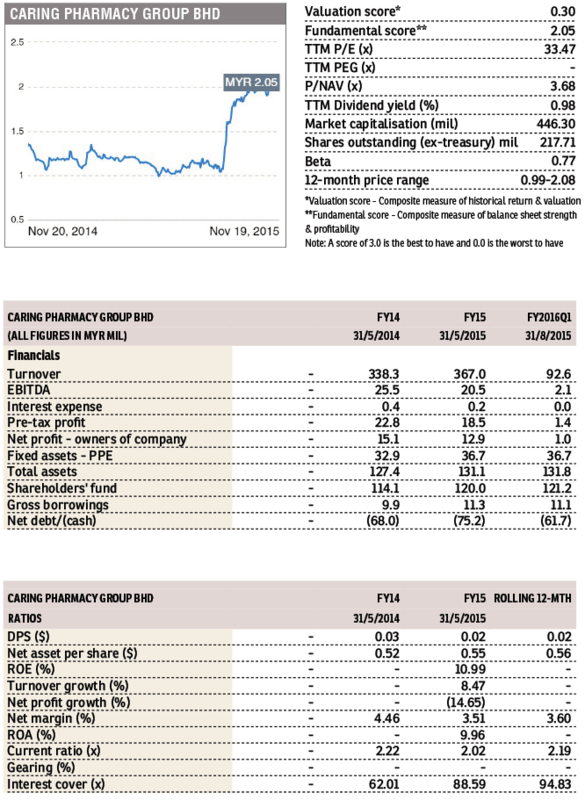 This article first appeared in The Edge Financial Daily, on November 23, 2015. CARING (Fundamental: 2.05/3, Valuation: 0.3/3) has triggered our momentum algorithm multiple times since July 30, rising 74.2% over the period to close at RM2.07 yesterday. Last month, Berjaya Group founder Vincent Tan Chee Yioun had disposed of 27.8 million shares or 12.76% equity interest in Caring to Perbadanan Nasional Bhd for RM50 million or RM1.80 per share. Tan still owns a 5.29% stake via Jitumaju Sdn Bhd. 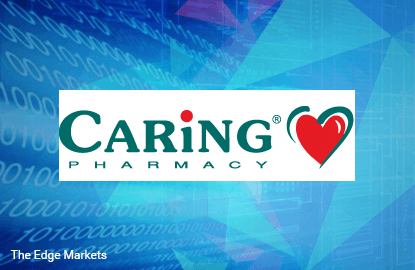 Listed in 2013, Caring is primarily involved in the retail of pharmaceutical, healthcare and personal care products. The company currently has a total of 106 community pharmacies throughout Peninsular Malaysia. For the latest 1QFYMay2016 earnings results, net profit jumped 83.9% y-y to RM1.0 million on the back of a 4.7% rise in sales, attributed to nine new outlets opened in FY2015 and commencement of three new outlets in 1QFY2016. The stock trades at a high trailing 12-month P/E of 33.5 times and 3.7 times book.